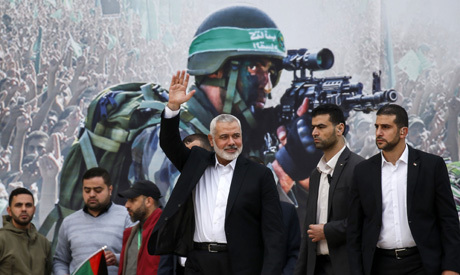 Hamas leader Ismail Haniya praised "resistance" in the occupied West Bank in a speech to tens of thousands on Sunday after recent deadly attacks against Israelis. Haniya made the comments at a rally in Gaza City for the 31st anniversary of the Palestinian Islamist movement's founding. "We place our hopes in the West Bank, which is the main area where events are occurring and the most appropriate area to resolve the conflict with our Zionist enemy," he told the crowd, which waived green Hamas flags. "The West Bank has shaken and stood up with glory, strength and skill, as if it wanted to say to our people on the occasion of this glorious anniversary that it was with the resistance, in total harmony." Members of Hamas's armed wing, the Ezzedine al-Qassam Brigades, participated in the rally in camouflage and carrying rifles, while presenting a range of weapons. Hamas runs the Gaza Strip but also has a presence in the West Bank, where its rivals from Palestinian president Mahmud Abbas's Fatah are based. The group has claimed two recent deadly shootings in the West Bank, which has seen an upsurge in violence over the past week. They included a December 9 attack near a settlement that led to the death of a baby prematurely delivered after his mother was shot and wounded. A total of seven people were wounded in the attack. An October 7 shooting in the West Bank that killed two Israelis was also claimed by Hamas. In another attack on Thursday, two soldiers were shot dead at a central West Bank bus station near a settlement. The two Palestinians behind the attacks claimed by Hamas were shot dead by Israeli forces during arrest raids last week, Israeli officials said. Israel's security forces have also carried out raids in Ramallah and say they have also arrested at least 37 Hamas operatives in connection with recent violence. Earlier Sunday, Israeli Prime Minister Benjamin Netanyahu said he had issued a warning to Hamas after the recent attacks. He referred to a controversial Gaza ceasefire in November that ended the worst escalation between Israel and Hamas since a 2014 offensive. "I conveyed a clear message to Hamas -- we won't accept a situation of a truce in Gaza and terror in Judea and Samaria," Netanyahu said, using the biblical name for the West Bank, as is Israel's policy. "We will exact a high price over them," he said of the attacks. As part of efforts to restore calm in Gaza, Israel has allowed Qatar to bring fuel and tens of millions of dollars to the besieged territory for salaries.